In this episode, John Sloop, Vanderbilt’s associate provost for digital learning. talks with Casey Doyle, assistant professor of rhetoric and writing and director of the Digital Writing and Research Lab at the University of Texas at Austin. For more on teaching with podcasts, see Episode 27 for our interview with Vanderbilt’s Gilbert Gonzales. Derek Bruff: [00:14] Welcome to “Leading Lines,” a podcast from Vanderbilt University. I’m your host, Derek Bruff, the Director of the Vanderbilt Center for Teaching. In this podcast, we explore creative, intentional, and effective uses of technology to enhance student learning. Uses that we hope point the way to the future of educational technology in college and university settings. [00:24] In this episode, we have another interview from John Sloop, Vanderbilt’s Associate Provost for Digital Learning. Here on the podcast, John has been exploring how colleges and universities understand and teach digital literacies. He continues that theme here with an interview with Casey Boyle, Assistant Professor of Rhetoric and Writing, and Director of the Digital Writing and Research Lab at the University of Texas at Austin. [00:46] John talks with Casey about the work of the Digital Writing and Research Lab, how it is helping students and faculty both produce and think critically about digital and multi‑modal texts. Casey also talks about his own teaching, particularly his work teaching students to, as he says, write sound. He’s doing some really cool things in his rhetoric courses. John starts by asking Casey to talk about the history and mission of the Digital Writing and Research Lab. John Sloop: [01:13] I’m here in Dallas at the National Communications Association’s annual convention. Casey Boyle is here with me. 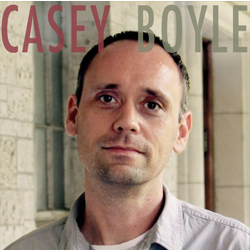 Casey Boyle is the Assistant Professor of the Department of Rhetoric and Writing at the University of Texas in Austin, where he researches and teaches Digital Rhetoric, Composition Theory, and Rhetorical History. [01:45] He’ s managing editor of “Enculturation, a Journal of Rhetoric, Writing, and Culture”…he was managing editor of “Enculturation, a Journal of Rhetoric, Writing, and Culture” as well as co‑editor…you still are co‑editor, with Scot Barnett? Casey Boyle: [01:59] Oh yeah, yeah. The essay collections, yes. John: [02:02] The essay collection “Rhetoric, through Everyday Things.” That’s pretty recent. Casey: [02:05] It came out last year and paperback came out this year. John: [02:10] Right now, Casey is completing his first book. I think this is in production. Is that correct? Casey: [02:17] It will be out next September. John: [02:16] Be out next September. “Rhetoric as a Posthuman Practice” explores the role of practice and ethics in digital rhetoric. [02:23] Professor Boyle is also currently, and one of the reasons why I wanted to talk to him today, is currently Director of the Digital Writing and Research Lab at the University of Texas, Austin. As far as I know, it’s one of the longest running one of these labs in the nation. John: [02:39] 30 years. Why don’t we just start with you. Tell us a little bit about the mission of the lab. Tell us a little bit about the history, too. I know that it’s produced all types of things over time. Talk a little bit about what the mission is, what it has been, how it’s changed. Casey: [02:53] Well, it’s the Digital Writing and Research Lab at the University of Texas. It’s a unit of the Department of Rhetoric and Writing, also at the University of Texas. Its primary mission is to facilitate undergraduate pedagogy and instruction in digital research, digital writing. [03:13] We have a number of grad student staffers who research projects related to digital writing and digital rhetoric. That’s our primary mission. [03:45] Basically, it started because two grad students or a number of grad students drilled holes in walls to connect two computer classrooms. It was one of the first networked computer classrooms in the nation, at least, in the humanities. [04:20] He got a grant that funded all the brand‑new computers. It’s gone through a couple different names. Computer Writing Lab was one of the first names. It was a space where our first director, John Slaton, who was at the forefront, in the late ’90s, of thinking about making web text accessible. [04:51] Prior to that, we thought about just putting web text online, and we didn’t think about how people used web texts. He was one of the first to think through that. [05:05] The lab has a history in accessible technologies, teaching accessible technologies, and writing and researching with, back then, computers. [05:010] Now, the lab is, obviously, much more diverse. We do, basically, a range of different digital projects. We have podcasts. We have online journals of it. Students do mapping as a writing exercise. We have a robust series right now of critical gaming events where we open up the doors for undergraduates to come in and learn about critical studies of video games. They get to play the video games and discuss that. [05:45] We got a range of different activities and events that we put on and host. John: [05:57] When I look at the name of the lab, what is interesting is you talk about some of the change with digital writing and research lab. Does the university have a separate writing studio, a traditional writing studio? If so, do you work together or are they seen as very different missions? Casey: [06:12] Yeah, we do have what you’re referring to as a writing lab or writing center, I think they’re called mostly. We do have another one and that’s also another unit within the Department of Rhetoric Writing at Texas. We do not have…Obviously, we’re in the same department and we communicate between the two missions, but in the DWRL, our focus is on pedagogy research. [06:45] In the actual writing center, they focus in on more traditional aspects of writing. They don’t do as much multimodal instruction or exercises. They focus in on the written language rather than media. I can imagine, at some point in the future, us being a lot more coordinated and connected, as more and more students are using digital technologies as a form of writing, as it will become traditional. Casey: [08:14] Yeah, I think so. One of the things, and this is where traditional writing instruction and now media instruction is, I think you’re going to start seeing a bigger convergence of this. [08:25] There is a big difference in a traditional writing class, let’s say, between requiring writing and teaching writing. I think you’re starting to see in so far for the last 20, 30, 40 years, composition studies for instance has really advocated for this point. There’s a difference between teaching writing and just requiring it. [08:45] I think we’re on the other end for media production. What you have is a bunch of professors and instructors who will assign, let’s say, the students how to do a podcast. They’ll offload that instruction of how to actually do it elsewhere. That’s exactly how writing used to be in the ’60s and ’70s. It’s that you would require it in a lecture class, let’s say, but you wouldn’t necessarily teach the steps of it or the process of writing and all of that. [09:15] At some point, I think there will be a correction or alignment where we’ll start thinking more seriously about teaching digital media rather than just allowing those assignments to take place. John: [09:26] Yeah, I want to take that one step further. My own experience integrating podcasting into my classes, I’ve tried to learn some of that on, take it myself, etc. The piece that’s missing from me, and I didn’t realize this until the end of last semester, is actually assessment. I was pretty good at teaching the students how to build a basic podcast, how to work with that, but honestly, I didn’t know how to evaluate it once I turned them in. [09:54] Do you work on those issues? Casey: [09:57] Yeah, this is one of the things where you can tell it’s a student production. A lot of times, we see the light of, let’s say, an edited podcast or something, and our quality meter goes way down. We’re happy they did it. It sounds good, it looks good if it’s a video or something but the quality’s definitely not there. I don’t teach in RTF program where I’m teaching them industry standards. [10:26] One thing I do, I’ll give you an example. In my Writing with Sound class, it’s focused on one medium, sound. Recording sounds, editing sounds, producing it, mixing it, for the most part, my classes have 23 students. At any given semester, I’m teaching this semester, there’s about 20 students who come in who have never done this before. [10:54] They come in averaging [inaudible] . The first couple of assignments, the first couple of projects they do, they’re just not that good. There’s sort of what Ira Glass calls “The Gap” between what they can see and what they like in their taste of what they can recognize as being good and their ability to actually produce that. There’s a gap between those two things. [11:15] You can see that they’re trying to do this sort of thing, but they’re not just quite reaching it. What I do in that class is I give them real grades. If it’s a bad quality thing, I’ll give them a C or an F on it. I don’t ask them to rewrite that thing. [11:28] Usually, at least in the Writing with Sound class, the next project they turn in, if they have improved on those particular techniques or skills from the last one, like, let’s say, the voice over was really badly recorded, just really noisy. Let’s say the levels were all off, let’s say it wasn’t mixed and normalized very well. If they can improve on those things, I’m not going to hold against them the fact that they learned in their early assignment. [11:58] What happens is whatever grade they get on that second assignment, I just automatically give it back to that first assignment too. If they get an F on that first assignment, which a lot of them do, and I explain this really well. If they get an F in their first assignment, it’s a way for me to show the quality of where this is, but the next time they get a B, I give them a B for their first assignment too. [12:20] Eventually, the students actually come out and they work really hard and they develop these skills that they never had before, they just never worked with before. I don’t hold against them the fact that they actually learned how to do it. John: [12:33] That’s going to be something for me to learn from because I do find myself just impressed that they actually did it. I know that’s not enough, as a first step that’s certainly the way I’ve been looking at it. [12:50] While we’re talking about sound, one of the things that I’ve seen or discovered is that the students have a tendency to…I guess they do this in most forms of expression, but some of the most successful sounding podcast are really aping, something that are replicating something they’ve enjoyed, something like Serial. They make something that sounds very much like that. Do you discover that a lot? Casey: [13:16] Absolutely. I’ve been teaching this class now for four years and my Theater, sixth time I teach it. It gets better every semester I teach it because I get better and better examples to show them. The whole class is me inundating them with examples. It’s really important that you show them great examples to model. This is the basic of rhetorical training, is imitation. John: [13:42] Are you talking about models from other students or models from elsewhere? Casey: [13:46] Models from other students, I build those up. Also models from other podcasts. One of the assignments they have to do for this, let’s say, Writing with Sound class, is that they have to listen to one podcast for a number of weeks and then they do a genre analysis of that particular podcast, but also podcasting in general. [14:03] They’ve chosen this podcast to listen to so they’ve got this really deep connection to one particular podcast. They do imitate those moves. This is why I always make sure that I approve which podcast they are going to select to do this. [14:23] If it’s just like this, I’m not sure how you are going to produce this or mix this if this is going to be sonically rich or not, but if it’s just two people talking, I want them to have a slightly more sonically rich podcast to listen to, something like a Serial or a 99% Invisible or one of those things. John: [14:38] Switching gears a little bit, but not too far. I think a lot about how to encourage digital literacy across the curriculum. I’ve come to this sense that what I have to do, part of my job should be to make everything a faculty might want to try seamless or as friction‑free as possible. [15:05] My sense really is that if the faculty are not only willing but very open to trying out new ideas, trying out new assignments in every discipline, STEM disciplines are interested, we’re thinking poster sessions where everyone is interested in doing these things, but if you make it hard to do that, then they just continue doing what they’ve done before. [15:28] In fact, you came up a couple of years ago when I was first thinking about myself learning how to podcast to do that in classrooms..I was trying to think about what resources were available to me. I was stumped. What I would do normally in this case is I would call somebody I know, like you. That’s not a good enough resource for a university to have. [15:47] I’ve been trying to make sure that resources are available. When I was looking at your website, you have the section on there of lesson plans, is that helping with that in certain ways? Is that providing models for faculty…? [16:12] They ask for the assignments, they ask for the lesson plans, that sort of thing. I’m sharing that to my colleagues at other universities. I share that material with them. I consider syllabi and assignments as just open source. These are things that we create and they can go off in the world and do their own thing. [16:33] In response to the idea of the friction‑free stuff, there’s a balance I think you have to do there. I think if you do friction‑free all the time, then you’re almost encouraging…because with my students, for instance, I don’t want it to be friction‑free. I want to have a little bit of friction in there. [16:52] They need to have something that they can get traction to where every once in a while, something is disrupted in a slight way. They have to think about, “Oh, wait. This doesn’t work. How do I readjust? How do I do this?” I want to engineer those friction-full moments here and there. John: [17:07] You mean with students? Casey: [17:08] With students but also, for instance, our lab is…one of our major aims is to encourage and to facilitate digital pedagogy. What a lot of our staffers do is they’ll do workshop for instructors, like the thing that you’re asking. If you were at Texas, you could fill out a form and then one of our staffers would come and do a workshop for your class on how to edit an Audacity file, let’s say. [17:38] They’ll packages this and they’ll do that. If it’s so seamless…for some folks, that’s not necessary. You want to encourage the students to engage digital literacies, but sometimes if the instructor wants to truly learn this and to incorporate this as part of it, at a certain point, they have to wrestle with the tech. They have to wrestle with the problems that come up because they do. They come up all the time. [18:05] Being OK with changing plans and having to figure something out, that’s the most important thing about digital pedagogy, I think. John: [18:14] [laughs] I do want that with the faculty after they’ve made the first jump. John: [18:23] [laughs] I know from following you on social media that you guys have a 3D printer, a quality one. Right? John: [18:33] What are you planning on doing with that? Casey: [18:35] Last semester, I taught a course called Accessible Rhetorics, and it was a graduate course. It was dealing with the problem of accessibility. Not the problem, but really the possibility of accessibility in digital technology, mostly in communication media, but also other kinds of technologies. [18:50] One of the assignments that we did in that class was to work with some physical computing devices like Arduino or Raspberry Pis to create and speculate about a…I don’t want to say fake, but creating ideas for…creating an accessible technology. One of the things that we did in that class, we created these things. [19:15] If you’ve ever seen one of those circuit boards and the bread boards, they got wires everywhere and stuff like that. One of the great things about 3D printers is that you can print a casing for that. The next time I teach that class, I’m going to have…the entire class is going to be working around developing and speculating about physical computing devices to respond to accessibility needs. [19:42] We’ll be using the 3D printer to print casings and stuff like that. The other thing we’re looking to do with it is…One of the projects we’re really excited about is thinking through…You’re familiar with infographics, right? Casey: [19:55] We’re thinking through what does an infographic look like if it’s 3D? What does it look like? What kinds of rhetoric can happen? What kinds of persuasion can happen if you develop a chart that is, instead of a two‑dimensional thing on a visual graphic, what happens if you create an object out of that? [20:13] What kinds of data can you expose people to and relay to people through an actual object rather than a visual print‑based document? John: [20:23] Is this being done a lot by graduate students, by undergraduates, or…? Casey: [20:28] Right now, all of our staff are grad students. The lab provides them a space to research these technologies to later use in undergraduate courses and workshops. Right now, it’s all graduate students. [20:42] But over the next couple of years, what we’re really planning on doing is opening up more and more events for undergraduates to come in outside of their regular classes to engage these kinds of things in discussions. I said earlier, one of the things we just started this year is an event called Game On. We do it on Friday afternoons. Every couple weeks, we do one. We do basically two a month. [21:06] One of our graduate student staffers creates a three‑minute short, critical video about a particular kind of game. Last week, we did one on what’s called platform video games. These are the video games where they have…Donkey Kong is a platform video game. We set up one of our studio spaces with five different game systems. We bought some snacks and some soda and stuff. It’s geared toward undergraduates. [21:37] They come in. They listen, and they watch the video and then they just play the games. We walk around. We talk to them about critical engagements with these video games and how to think about video games as a rhetorical device but also a cultural artifact that we can critically engage. That’s one of the events we’re doing that’s geared solely to undergraduates. We’re thinking about a couple other ones. [22:05] One is an event that we’re still planning. Basically, it’s called Real‑Time Rhetoric. The idea, what we’re doing is, we’re going to have…Let’s say, The State of the Union’s going on. We’re going to have students come into the studio space. We’ll together collaboratively annotate the media event of that particular political development. Let’s say, it’s The State of the Union Address. [22:32] Some students will monitor social media to see what’s trending. They’ll look at Facebook. They’ll look at websites and basically do a real‑time critical analysis of how a political event is unfolding. That’s another event we’re looking to launch in the spring. John: [22:50] If you did that on an ongoing basis, is this something you would make available as through your news and public affairs office because it seems like it could be great outreach to…? Casey: [23:00] Yeah. That’s one thing. These are new events, so we want to kick them off. We want to go through them a couple times before we talk to outreach. We are talking to outreach. In fact, next, when I go back to Austin after Thanksgiving break actually, me and the chair of the department are sitting with our liberal arts media outreach person. They’re going to do a story about the lab and love what we’re doing right now. John: [23:29] That’s great. I only want to ask you a couple more questions. First off, I want to give you the opportunity. Talk a little bit about your book. John: [23:38] When you’re writing something like this, it’s not just for professional purposes for tenure, etc. I know you’re hoping to change some conversations. What is it you’re attempting to do? Casey: [23:53] The book is called Rhetoric as a Posthuman Practice. This is a project I’ve been working on for a number of years. The word “posthuman” usually scares people off. They think of the cyborg or these really bad movies of people uploading their consciousness to some machine, living forever or something. That’s not what the idea of a posthuman is. [24:15] The idea of the posthuman is to reconfigure what it means to be human in an environment in which we acknowledge all the mediated relationships we have. If we look back at what humanism has meant and become in the West, it’s based around literary practices more or less. It’s based around the letter to a friend. It’s based around the philosophical novel or the philosophical treatise. [24:39] It’s based around this idea of, in the West anyways, mostly a rational European male who can clearly articulate some experience of being and clearly and cogently and persuasively articulate this. This is what bases around what the human means. If you look back at, let’s say, Leonardo da Vinci and the Vitruvian Man, the ideal, it’s a European male who’s perfectly fit, perfectly balanced. [25:11] What doesn’t fit in the Vitruvian Man diagram, which is that epicenter for what humanism is, is the non‑European [laughs] fit male. That’s always the base of what humanism is and does. What posthumanism does, it emerged around ‑‑ this is a backstory for the book itself, but it emerged around critical feminism and critical feminist materialism, thinking through how technologies mediate what it means to be human. [25:46] The book itself is thinking about rhetoric as always that posthuman practice. Since its earliest inceptions, the earliest texts ‑‑ we think about Plato ‑‑ rhetoricians and sophists, they were always framed as being somewhat inhuman. They weren’t the ideal philosopher. They weren’t the ideal king. They were someone to be maligned. [26:11] They were someone who paid too much attention to how things were mediated. What I’m doing with the book is thinking about how media and literacy practices help determine and can reorganize what we think of as the boundaries of what humans are and do through media practices. [26:29] What I do with the book is I look at three different moments in rhetorical history and really go back and think about these moments. These moments are the emergence of certain practices in rhetorical training. [26:46] Dissoi logoi, which is the argument for and against; topoi, which is a notebook practice; and copia, which is an exercise, a writing technique, where people would copy and repeatedly write different sentences, but having the same sense. One thing I found is that each of those moments came out of a certain kind of media emergence. [27:15] Dissoi logoi, for instance, comes out of a tradition of chirographic writing where people wrote…They didn’t have that much writing materials around, so it was double‑sided [laughs] basically more or less. That’s what you had. When topoi rises and intensifies, it’s notebook practices. When copia comes around, it’s kind of in response to print‑based writing, the repetitions of things. [27:34] If we think about those moments as not just like, “Oh, these are just new techniques that people came up with,” but as responses to certain media emergences, then we start rethinking what the human is and does because that’s what it is. It’s working within those media ecologies. John: [27:53] I was about to say this is a really practice‑based way of thinking about media ecology. I’ll look forward to reading it. This podcast is focusing on educational technologies, digital learning. We’re really interested in…what is your favorite non‑digital education technology? Casey: [28:15] Non‑digital. This one’s a tough one. I think if I had to answer it, I will answer it. I think my favorite non‑digital would be the highlighter. Just a simple highlighter to be able to read a text and recreate that text by engaging with it, reading it, and highlighting certain passages. [28:36] Once you do that, it’s a way that you don’t deface the book that you’re reading in a way that you can’t read it anymore, but you’re picking out and highlighting certain things that matter to you or don’t matter to you. Maybe you highlight too much or whatever, but I always like seeing a really well‑highlighted book. John: [28:57] I love this answer, but do you also use highlighting tools digitally? Casey: [28:59] Yes, I do. I pretty much only ever read now with PDFs. Most of the books I read are PDFs. The PDF reader I use, it allows me to highlight certain passages. The way I’ve done this is I’ll highlight certain passages. I’ll make comments and annotate in there, but the actual PDF reader I use allows me to export everything I’ve highlighted. It’ll export it into a plain text file. [29:28] If I’ve highlighted a passage, I can export that text file into an email and then just copy and paste that into a document I’m writing. Casey: [29:40] Even when I’m reading things, I’m writing because I can just use that text and build up from there when I’m writing a draft. John: [29:46] All right, Casey. I want to thank you for being with us. Casey: [29:49] Thanks for having me. It’s been fun. Derek: [29:52] That was Casey Boyle, Assistant Professor of Rhetoric and Writing and Director of the Digital Writing and Research Lab at the University of Texas at Austin. In the show notes, you’ll find links to Casey’s work and the Digital Writing and Research Lab. I’ll also add a link to the detailed syllabus for Casey’s course, Writing with Sound. [30:07] I’ve been exploring ways to teach with podcast both in my own courses and with other faculty here at Vanderbilt. I found Casey’s syllabus really fascinating. Any syllabus with episodes of 99% Invisible, one of my favorite podcast, on it is pretty cool. [30:21] Bonus point for an assignment called Sonic Remediation. [30:24] For more and teaching with podcast, see episode 27 of Leading Lines, for our interviewee with Vanderbilt, Gilbert Gonzales. Stay tuned in 2018 for audio from a panel on teaching with podcasts that we hosted here at Vanderbilt this fall, featuring, among others, John Sloop, who interviewed Casey Boyle in this episode. [30:41] You can find past episodes of Leading Lines on our website, leadinglinespod.com. If you have thoughts on this episode, we’d love to hear them. You can connect with us on Twitter, where our handle is @leadinglinespod, or email us a voice memo to leadinglinespod@vanderbilt.edu. We’d love to hear from you. [30:57] Leading Lines is produced by the Center for Teaching, the Vanderbilt Institute for Digital Learning, the Office of Scholarly Communications, and the Associate Provost for Digital Learning. This episode was edited by Rhett McDaniel. Look for new episodes the first and third Monday of each month. [31:11] In January, we’ll have a couple of episodes on active learning spaces and the use of technology like laptops in the classroom. I’m looking forward to those two. [31:19] I’m your host, Derek Bruff. Thanks for listening.